The GBC Fusion 5100L A3 Laminator is ideal for frequent large office use and is equipped with a host of intelligent features and intuitive controls, that guarantee super fast, perfect results. Stylish and compact, it is ready to use in one minute and laminates a single document up to A3 size in under 15 seconds using standard 2x75 to heavyweight 2x250 micron pouches. The Fusion 5100L makes daily laminating exceptionally fast and easy and will recognise the pouch thickness and adjust the settings accordingly. A premium LCD screen displays manual settings as well as a help menu and a job counter (so you know how many documents you have laminated without having to check). 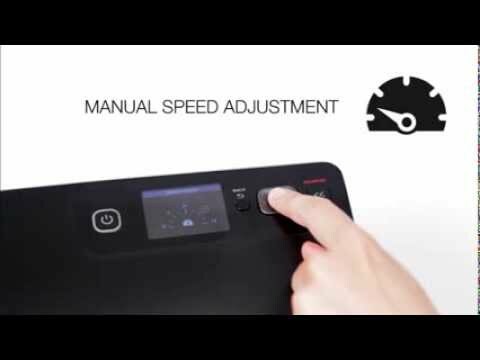 The Fusion 51000L will warm up in 1 minute (with a handy count down timer to tell you how much longer is left) and can laminate an A4 document with a 75 micron pouch in just 15 seconds for super fast laminating. In manual mode you can instantly switch between pouch thicknesses plus use an optional 'fine tune' temperature control setting for optimal results. An adjustable pouch guide keeps the document perfectly aligned whilst an auto-alert beeps and will then automatically reverse if a pouch is being misfed. The Fusion 5100L features a 4 roller system and exit cooling tray for a perfectly flat finish and fantastic quality. The machine will auto shut off after 30 minutes of inactivity to conserve energy.